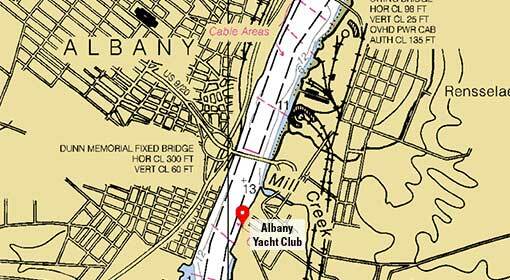 Albany Yacht Club is located 1.5 miles north of Green Buoy 221 (Coxsackie To Troy, NOAA Chart # 12348), on the east side of the Hudson River in Rensselaer, New York, just south of the Dunn Memorial Bridge (carrying Routes 9 and 20 across the river). We can be reached on VHF on Channel 16. For boating related matters, our dockhouse can be reached at (518) 445-9587. For all other matters, you can reach Albany Yacht Club at (518) 465-9228. We’re also on Facebook. You can view our page by clicking here. Please note that some older car GPS units will direct you to the Albany side of the river if you enter in Albany Yacht Club. 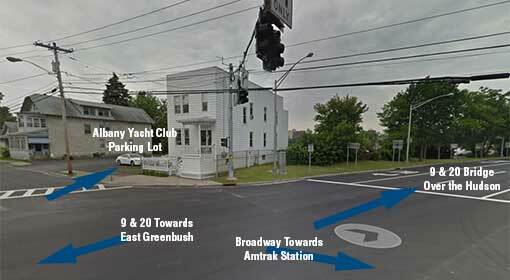 Albany Yacht Club does not have a sign by the road with our name on it. When coming across the Dunn Memorial Bridge (Routes 9/20) FROM Albany, take your first right at the light and then your first right into our parking lot. When coming down Routes 9/20 TOWARD Albany from the East Greenbush area, turn left at the last traffic light before the bridge (Broadway) and take an immediate right into our parking lot. When coming from the Amtrak station, follow Broadway across Routes 9/20 and take an immediate right into our parking lot. If you would like to make a dockage reservation, please fill out our dockage request form at the bottom of the AYC Dockage and Services page. All other requests can be made here.